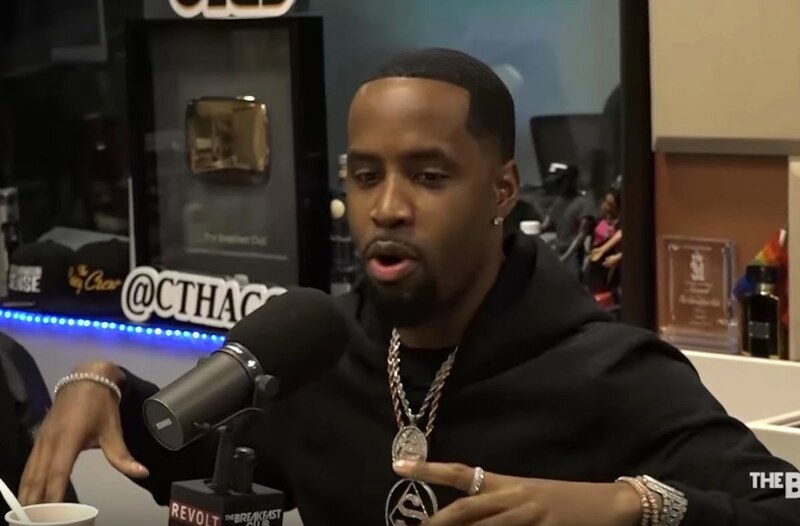 Safaree Samuels did his first interview since his meat was leaked online earlier this week. The Love and Hip Hop star paid The Breakfast Club a visit on Wednesday morning where he dropped off his new record “Hunnid” and discussed his leaked photos. Angela Yee even had his eggplant printed out on paper in front of her to discuss. Nevertheless, the interview with hilarious and even though Safaree denied leaking his own pics, the way he is using it to promote his music and his brand is genius. Charlamagne even labeled Safaree Samuels a THOT while putting him in the same category as Blac Chyna and the Kardashians. The Breakfast Club hosts even asked Safaree if he has ever been in a situation where he hurt a female or anything like that. “Question, have you ever rearrange a woman’s organs before?” Charlamagne asked. As to the reasons why he recorded the video in the first place, Safaree says he has been working out exceptionally hard so he just want to get a good look at his V-taper and he ended up saving the photos and videos on his iCloud account, which is where he thinks the leak may have taken place. His ex-girlfriend Nicki Minaj was also dragged into the scandal on social media when Twitter started the unsolicited Safaree Challenge.